” ‘Conductor’s music’ isn’t always used as a term of praise, and can refer to flashy, shallow showpieces, more dazzle and display than substance and structure. That doesn’t have to be the case, though. Both works in this, the final concert of the BBC National Orchestra of Wales’s season [B Tommy Andersson: Satyricon & Gustav Mahler: Symphony No. 2], were by composer-conductors, and showed distinctive signs of this in their virtuosic writing for huge orchestral forces, worthily realised by the orchestra and chorus under the baton of Thomas Søndergård, the orchestra’s Principal Conductor. B. Tommy Andersson is a Swedish composer and conductor who has been Composer-in-Association with the BBC National Orchestra of Wales for a productive and interesting season. His Satyricon, based on Petronius’s scabrous, sexually-explicit novel, is labelled as a ‘choreographic poem’ but might equally well serve as a ballet score. 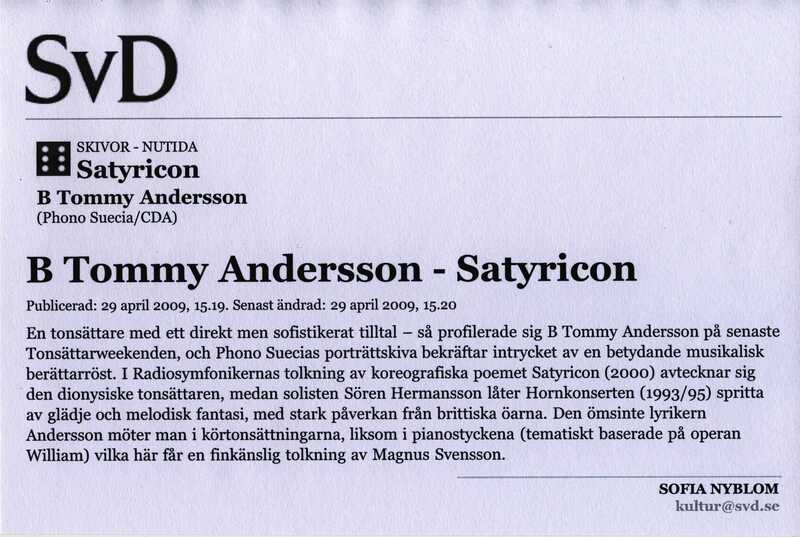 Andersson wrote it in memory of his friend the dancer and choreographer Per Jonsson. 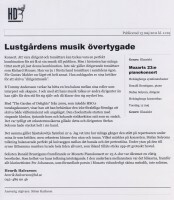 ” ‘The garden of delights’ is five years old now and is the work of a composer comfortable with his craft. There was no gentle leading in, no preparing the audience… ‘The garden of delights’ exploded into the auditorium with crashes from the percussion and brass interspersed with frenzied strings, woodwind, horns and woodblocks. The first section brought together lots of different characters, each delightfully individual - squelching brass, insistent woodblocks, in blocks of sound gradually overlapping into a multi-faceted dance macabre. […] The next section was much calmer. Quiet legato brass were followed by airy held chords from the strings. More colours were added, trumpets and clarinets only to be interrupted by flute birds, woodblock woodpeckers, and other percussion animals. The legato sections expanded into close, bright, disharmony and a return to earlier ideas. A brief pause preceded a rising line from cello and tubular bells which after some development gave way to a sinuous oboe solo and more birds and led in turn to a general falling of the material. If the earlier rising section was dawn rising, this was the sun setting and the world going to sleep. The composer encouraged the audience to allow itself to get absorbed by the atmospheres in the piece, and this fateful, slowly progressing piece was really deeply affecting. A fantastic world of sounds that followed us all the way. Bravo! “The RSNO concert was a veritable ‘garden of delights’. …..Such, in fact, is the title of Swedish composer B Tommy Andersson’s swirling musical representation of painter Hieronymus Bosch’s famous renaissance triptych, The Garden of Earthly Delights, which opened the programme. Placing it alongside Mahler’s Alpine-scented Blumine and Songs of a Wayfarer, and the rocky landscape of Sibelius’s Symphony No. 2, was tantamount to planning a musical botanical garden. …..In charge of it all was RSNO principal guest conductor, Thomas Søndergård, carving out these exquisite landscapes with intuitive definition. 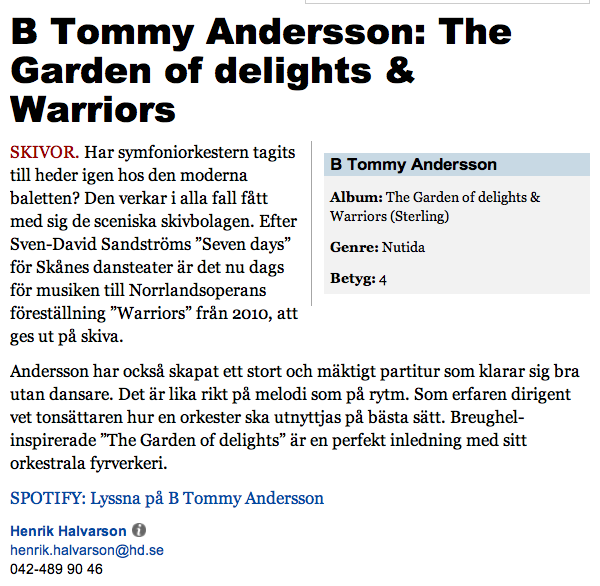 [...] Andersson has created a great and powerful score [Warriors], that very well manages to survive without dancers. It is just as rich in melody as it is in rhythm. Being an experienced conductor, the composer knows very well how to use an orchestra in the best possible way. Bosch-inspired “The Garden of Delights” is a perfect opening with its orchestral fireworks. 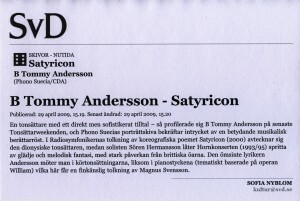 B Tommy Andersson has a long experience of conducting contemporary music, and also insights in the technique of orchestration, as well as in francophone timbre-seduction. All these qualifications are made justice. The Garden of Delights, inspired by the triptych of the painter Hieronymus Bosch, is a sparkling and colourful fantasy with tempestuous features, as well as paradisiacal atmospheres. The wealth of detail gives a visually surrealistic impression. …..A more robust approach and a hammering pulse dominates in the beginning of the dance drama Warriors, but also here we find change in romantically caressing harmonies and melodies. Motion and drama — music for a choreographer. …..The composer conducts the Umeå orchestra himself, meticulously and euphoniously, in this almost shamelessly beautiful music. More and more Swedish contemporary composers have lately returned to the first decades of the 20th century, sometimes even to Soviet modernism, without being occupied with postmodern stylistic games. B Tommy Andersson belongs to them, but unlike most of them, he has something to tell. As a conductor he knows from within how to create impressionistic and late-romantic orchestral sonorities, as well as how to sharpen brutality. To be both a conductor and a composer is seemingly a perfect combination in order to get your music out to the audience. But historically, many critics have frowned at precisely this combination. Not when it comes to Richard Strauss, who in the eyes of his contemporaries mostly was considered a composer. But the situation was different for Gustav Mahler, who was accused of composing ‘Kapellmeistermusik’ (”conductor’s music”, a belittling term). 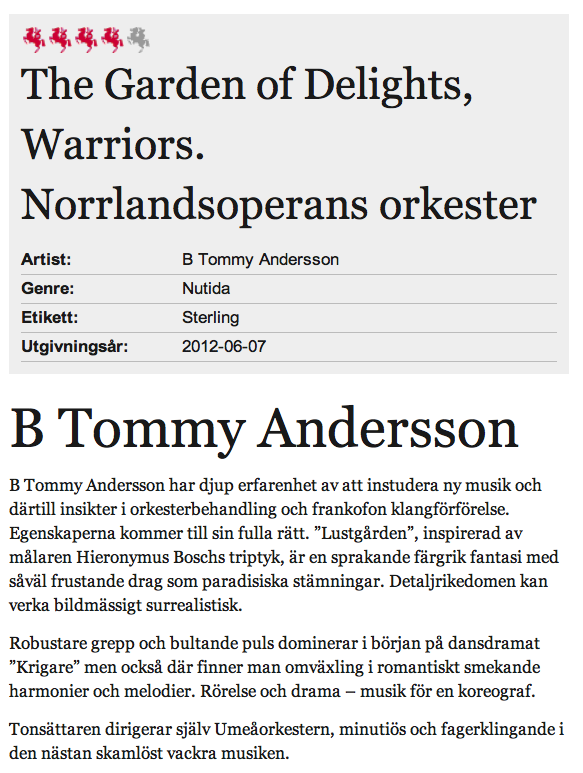 …..B Tommy Andersson seems to have found a good balance between his roles as interpreter and creator. Since his music is performed by other conductors, it has to stand on its own feet, which it does very well. [...] Wow! What a fantastically beautiful dance performance! I felt a lump in my throat from strong emotions. On a scale ranging from one to ten, this performance must be a twelve. It simply has to be seen. 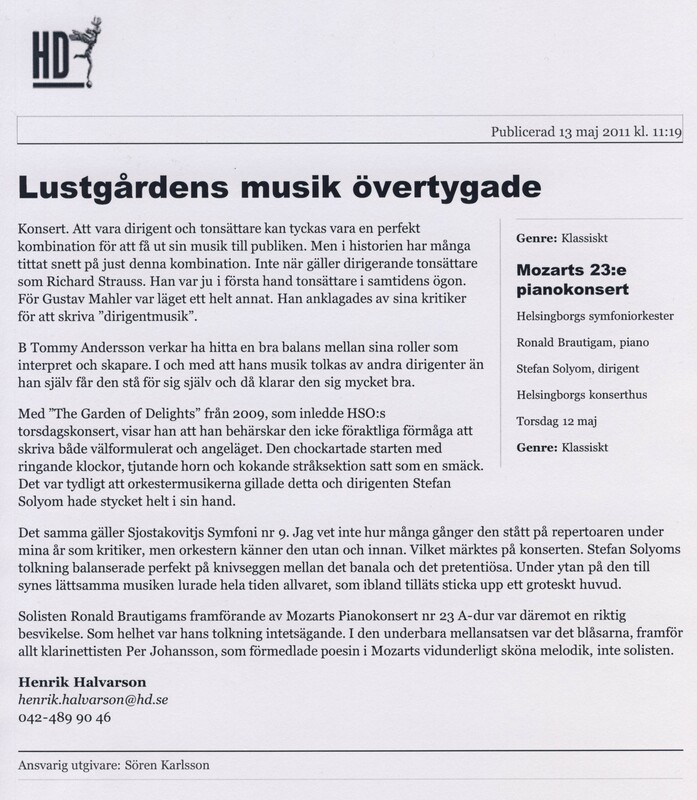 …..B Tommy Andersson’s The Garden of Delights is, according to the composer himself, inspired by the fascination of Hieronymus Bosch’s fantastic triptych at the Prado Museum in Madrid. …..Despite the rough weather, it became a distinguished artistic experience to hear this genuine orchestral music with such affluence of sound through the loudspeakers. In that way, the piece by B Tommy Andersson was in the same spirit as Concerto for Orchestra. …..So, it hardly came as a complete surprise to me, that the conductor B Tommy Andersson also was able to interpret Bartók’s music successfully. If I have to bring out two things that have to work perfectly in order to have Concerto for Orchestra to reach through the loudspeakers in an outdoor venue such as this, it would be the mischievous rhythms and the originality of the orchestration. In both cases, conductor and orchestra made great achievements, which reflects an extremely professional attitude. 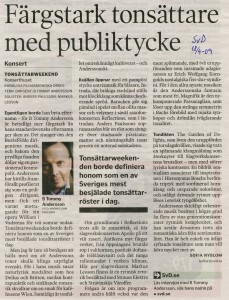 Some time ago, there was a festival in the Stockholm Concert Hall with the music of B Tommy Andersson, conducted by himself. Foremost, he is mostly known as a conductor, but from now on, nobody can be doubtful about the fact that he is a composer to be reckoned with. …..This is also proven by a recent CD with eight very impressive works of various kinds: two large orchestral works (Satyricon with the Radio Orchestra and a horn concerto with Sören Hermansson as a brilliant solist and the Helsingborg Symphony Orchestra) flanked by two lovely choral pieces with the Radio Choir and Ensemble Notus, and also piano pieces with Magnus Svensson. There is also a piece for soprano saxophone and orchestra with Anders Paulsson as a heartfelt soloist. …..The music is skilfully composed, inspired and personal. A composer with an immediate and sophisticated voice — that is the distinctive image that B Tommy Andersson has created during the composer’s festival that took place this weekend, and the portrait CD from Phono Suecia supports the impression of an important musical story-teller. The Radio Orchestra’s interpretation of Satyricon shows the Dionysian composer, whereas the soloist Sören Hermansson allows the Concerto for Horn and Orchestra to bound for joy and melodic imagination, with a strong influence from the British Islands. One faces the tender-hearted poet Andersson in his choral compositions, as well as in his piano pieces (thematically based on his opera William), here delicately interpreted by Magnus Svensson. 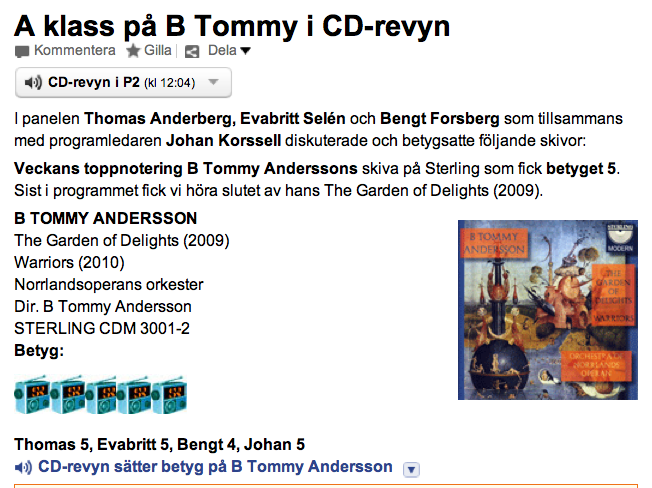 He should really change his name — because B Tommy Andersson is considerably more colourful than his common surname. The music of this conductor, born in Borås, is singing, and behind the neat facade hides a passionate cosmopolitan. Until now, Andersson has created a distinctive image of himself as a solid conductor, but his opera William was warmly received in Vadstena two summers ago. This composer’s festival should define him as one of the most inspired contemporary Swedish composers. …..I am reluctant to consider his music as typically Swedish, as we find a poetical modality, as with Delius and Britten, whereas counterpoint and mellifluous Romanticism reveals a taste for the coffee rooms of Vienna. At the same time the tone is unmistakably cultivated — and Andersson-ish. …..The evening starts with a stately piece of music for wind instruments, Intrada, where noisy city sounds are confronted with a bell sound that feels chockingly fragile. There are some baroque features in the interaction between mass and volume in the saxophone concerto as well as in Intrada. Anders Paulsson’s soprano saxophone becomes a voice singing above bouncing pizzicati and pleasurably raving through a composed solo cadenza. …..If the basic character of Reflections is romantic, then Apollo carries a wild rage. The ancient myth colours the music, from the brutal call of the horns in the beginning and poetically sweet-scented passages for woodwind, to the heavy rallentando at the climax of the piece. Here the percussionist Markus Leoson lends refinement to a rhythmical rhetoric, closely related to Strauss’ Elektra and Stravinsky’s Rite of Spring. …..The question is whether the second half of the concert was the most exciting, with two first performances surrounding the Adagio from Erich Wolfgang Korngold’s nostalgic Symphony in F-sharp. It is in the most recent music that Andersson’s imagination is the most free. The new Passacaglia is magnificent, dissolving the rigid symmetry of Bach’s piece into soft syncopations and dreamlike, sliding tonality. …..The tone-poem The Garden of Delights, another premiere performance, turned out to be an exciting tone-painting, re-establishing the brutality of the percussion concerto, but with larger lyrical contrasts. A sensualism, full of imagery, forms associations with Hieronymus Bosch’s famous triptych, with muted horns, solo voices and impatiently pushing rhythms that dissolve in ethereal weightlessness. …..Andersson’s skilfully orchestrated music has, to a greater degree than several of his contemporaries, a rhythmic complexity, and, despite his romantic vein, he refrains from sentimentality. He is simply an honest composer, that one wants to hear more of. The versatile B Tommy Andersson has managed to live several parallel lives during his 45 years on this earth. Apart from an impressive lifework as a composer, he has had just as full a career as an orchestral- and opera-conductor. …..If our peculiar music life had not been so complaisant to foreign concert managers, he would, since long, have been able to choose any Swedish symphony orchestra to become principal conductor. Perhaps the musicians would have discovered what a unique pedagogue and orchestral fosterer that would be included in the bargain. …..In these sad circumstances, and the fact that his conducting technique does not play to the gallery, the courage of the Stockholm Concert Hall in deciding to let us spend an entire weekend with him in a kind of “This is your life”-perspective, is worth a special medal for great achievement. …..During five hours of music, divided into 24 different pieces (of a total of 110 compositions), we have been amazed at how maturely B Tommy Andersson composed even at the age of 17. That his music is similarly rewarding to sing and play, does not mean that he is treading in old footsteps, because he always creates something unexpected from the old. …..The reason why his choreographic poem Satyricon (based on fragments of a novel from the time of Nero) was such a success already at the first performance in 2004, was his ability to lead the energy of a late-romantic symphony orchestra into his own lines. Hardly a long line without cheeky syncopations and tantalizing rhythms picking on the melody. …..During the last two concerts, we have been able to enjoy the sixteen infallible choristers from Olof Boman’s wonderful Ensemble Notus, the rich baritone voice of Andreas Landin, the delicate touch of pianist Magnus Svensson and a lovely duel between Dan Laurin’s recorder and Markus Leoson’s percussion instruments. …..Nor shall we forget Sören Hermansson’s admirable flexibility in Concerto for Horn and Orchestra, even if his instrument did not sound as brilliant as in the portrait CD that was released by Phono Suecia this week. …..Not a single one of the pieces performed during the festival have been redundant. After having studied the references of B Tommy Andersson, such as Korngold, Dowland, Messiaen and his teacher Sven-Eric Johanson, one often wished to hear some of the pieces one more time. But the orchestral pieces Satyricon and The Garden of Delights are already little short of classics. B Tommy Andersson’s often strikingly beautiful, melodious, and singable music brings out [Håkan] Lindquist’s straightforward and tangible text, describing the emotional changes, the atmospheres, and gives contemporary colour. The orchestra plays with great sensibility, caressing strings and rhythmical precision, adding a restless pulse to the emotional state, and colours the dream sequences with harp and piano. William is an intensely hyper-romantic opera. In the central scene, where William’s heart exceeds all bounds and his heartbreaking yearning breaks down Marlowe’s defence, the music is just as hot as the temperature in the auditorium, the Wedding Hall, in the sun-heated castle. It is obvious that the composer, who is also a conductor, has experience of working with opera and with orchestra. It is a practitioner who has been holding the pen. He knows how to write for the voices in a way that they sound excellent, and he knows all about how to deal with pulse and timing in order to make a scene come to life. He also knows how to create an instrumental background to what is taking place on stage, as well as how to make the music expressive and attractive, without becoming trite or embarrassingly eclectic. One immediately wants to hear this opera again. 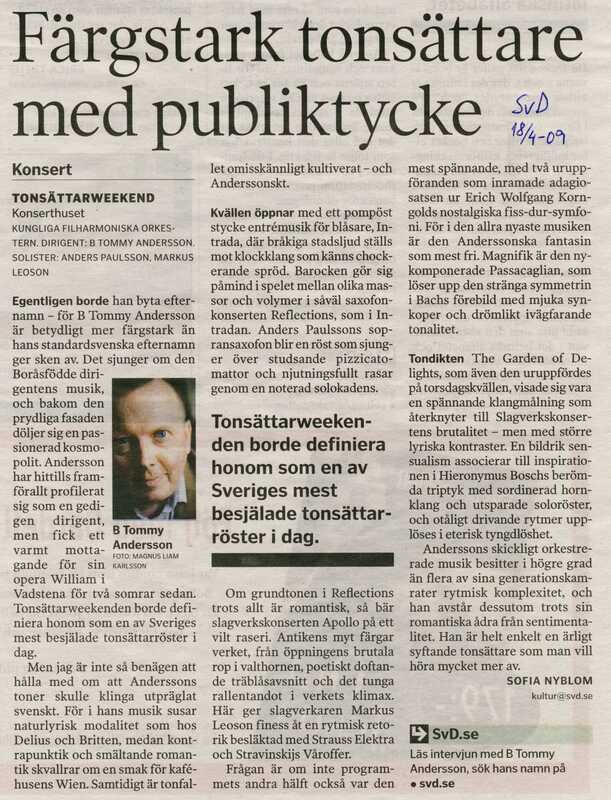 This is to say that B Tommy Andersson’s debut as as opera composer is very successful. ”Tematiken — Roms förflutna — för tankarna till Respighis prunkande orkesterdikter och några ekon av Romerska fester finner man också i Satyricon. B Tommy Andersson har utnyttjat sina gedigna orkestererfarenheter till att komponera en bild- och färgrik musik, alltifrån inledningen, där träblåsarna en efter en träder fram över stråkmattan, över ett virvlande scherzoavsnitt och en kort lamentation fram till det backanaliska slutet. 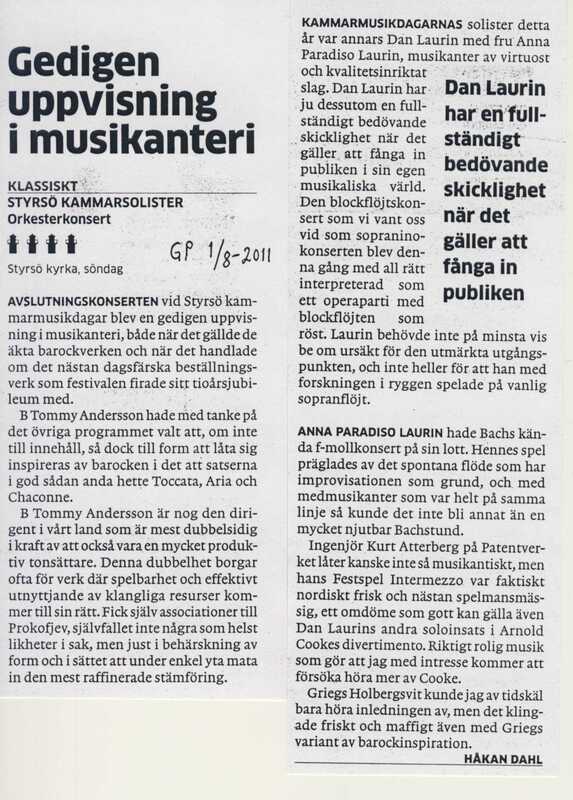 Den senromantiska klangapparaten utnyttjas med stor uppfinningsrikedom och B Tommy Andersson visar också en glädjande förmåga att foga in snabba moment i musiken; här är vi långt från de tunga block som präglat så många av modernismens tonbyggen. …..Det gäller också för Reflections, den korta sopransaxofonkonsert som under tonsättarens ledning och med Anders Paulsson som solist uruppfördes av Jönköpings Sinfonietta för två veckor sedan. Med avstamp i en sång av John Dowland är det här ett mindre grällt men för den skull inte mindre virtuost stycke där Anderssons förmåga att att förena rytmik och melodik ger ett färgrikt och fascinerande resultat. Också här rör det sig i hög grad om musik i högt tempo: soprangirlanger över ett staccatoartat ackompanjemang. The theme — Rome’s past — brings the the thoughts to Respighi’s dazzling tone poems, and some echoes from Feste Romane are to be found in Satyricon. B Tommy Andersson has used his solid orchestral experience to compose a visual and colourful music, all the way from the beginning, where the woodwind players one after another tread over the string chord, via a whirling scherzo, and a short lament, to the bacchanalian ending. The late-romantic apparatus in used with great inventiveness, and B Tommy Andersson shows a gratifying ability to incorporate fast elements in the music; we are here far from those heavy blocks that have been so significant for many of the creations of musical modernism. …..This applies also to Reflections, the short soprano saxophone concerto that was first performed by Anders Paulsson and Jönköping Sinfonietta under the composer two weeks ago. With a song of John Dowland as a starting point, this is a less glaring but by no means less virtuoso piece, where Andersson’s ability to combine rhythm and melody gives a colourful and fascinating result. Even here it is to a high degree music in quick tempo: soprano garlands over a staccato accompaniment. …..B Tommy Andersson has with these works proved himself to be a skillful and entertaining composer with a capacity to captivate a large audience, something that one hopes that other institutions will notice. B Tommy Andersson is mostly known as a conductor up to now, but judging from his percussion concerto Apollo, composed for [Markus] Leoson, it will not take long before he will be a name to reckon with also as a composer. I have rarely heard such a playful (musikantisch) contemporary piece, a work so full of zest and knowledge of the instruments. The solo part plays predominantely on instruments with no pitch, but despite this limitation, the piece thrives on a blend of suggestive rhythms, lush orchestrations, and singable melodies. Andersson’s version of Apollo clearly has Dionysioan features, that is the only conclusion one could draw from such a hedonistic experience.